Robin Jacobs has been a part of the new Brighton High School since it reopened its doors back in the mid 1990s. And during that time, Jacobs hasn’t missed a single play of Brighton Football as an coordinator and assistant head coach. Now he’s the man in charge of the program. When some Tipton County residents think of Brighton High School, the name Robin Jacobs might be the first thing that comes to mind. Some identify Jacobs with the school that opened up in 1996. The veteran coach has made his name as an assistant football coach and creating a powerhouse softball program. In recent years Jacobs has severed as assistant head coach under Will Wolfe for Cardinal Football. The team enjoyed a successful run never seen before at Brighton with District 13-3A titles, a 10-win season and players like Ricky Foster and Charles Mosley signing to Division I schools. 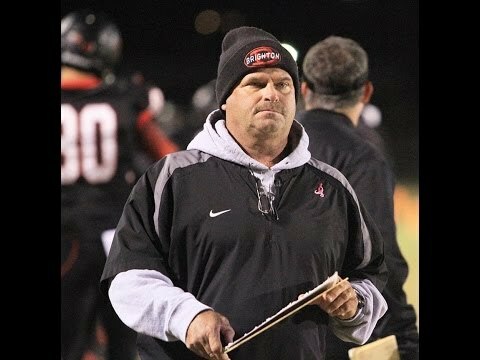 Earlier this year, Wolfe made the decision to resign as Brighton’s head coach to return home to Hernando, Miss. The administrators at Brighton High School made the choice to stay home and name Jacobs the new leader of Brighton Football. In the springs, Jacobs leads the Brighton Lady Cardinal Softball team. Since 1999, the Lady Cardinals have reached multiple State Tournaments and won more than 500 games. Jacobs said while he’s working with softball, he will count on his assistant football coaches to conduct offseason workouts. He said he will be a facilitator for his young staff. The assistants at Brighton have worked along side Jacobs for years and the coaches will build on some of the workouts Wolfe brought to the program. Jacobs acknowledged Wolfe left another tradition that will be hard to fulfill…winning. Jacobs said he’s ready for the challenge. And the veteran coach said he is deeply honored the school he loves entrusted him with the football program.